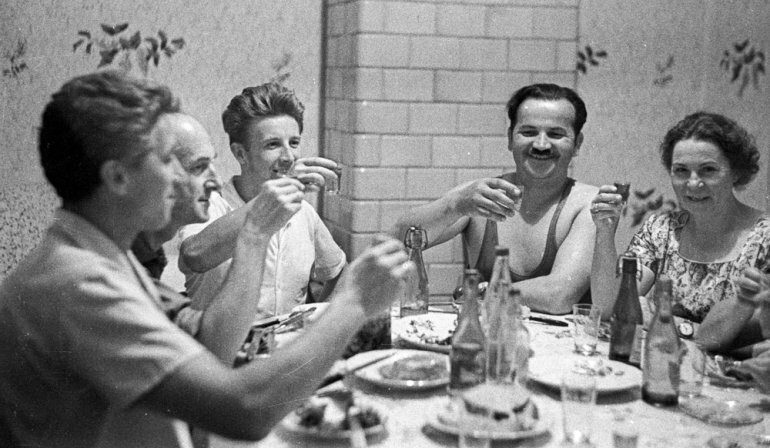 The culinary tastes of the generations born in the PPR (the Polish People’s Republic) were mostly shaped by canteen food and home cooking, which was based on an inventiveness forced by the economic situation. Traditional cookery was replaced by nutritional knowledge and taste by caloric content. Food was treated as mere fuel for the working class. Such relics of the past as the cuisine of the nobility and the bourgeois were despised, and the catering industry collapsed. 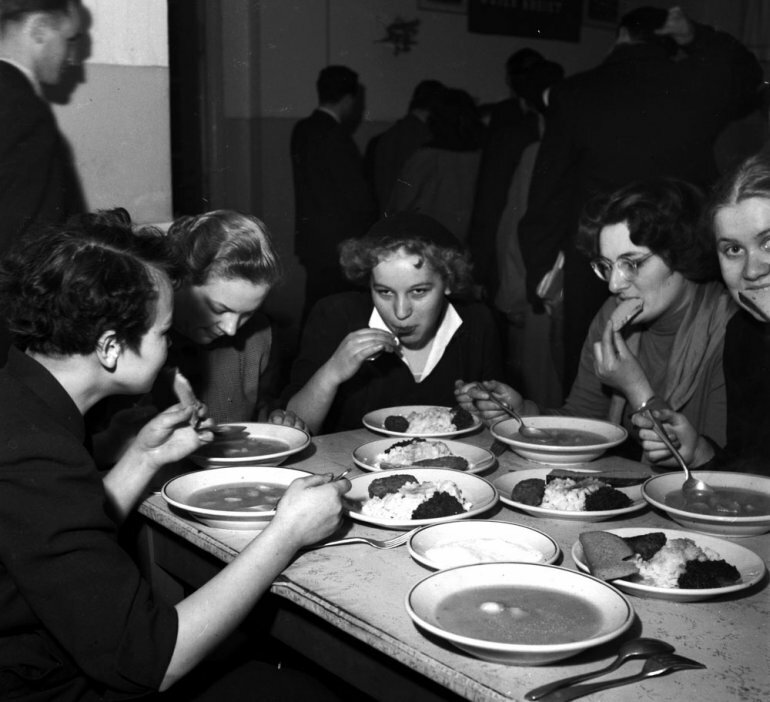 Poles used to eat at home, in canteens, or in ‘milk bars’ (very cheap eateries, typical of the PPR, serving mostly dishes based on dairy products). Cuisine became homogeneous, just like the authorities wanted society to be. Spices and products such as olive oil, parmesan and capers vanished from kitchens. Markets and greengrocers were dominated by cabbage, root vegetables, parsley and dill. To be a chef was no longer a prestigious profession. Of course, there were also restaurants in the PPR serving more sophisticated dishes, but they were rarely affordable for the average citizen. They were rather meant for notables, whose tastes were often primitive. For decades, most Poles didn't have any contact with foreign cuisine. Due to tremendous problems with the food supply, housewives were forced to become masters of creativity. Are the adult Poles who spent their childhood or youth in the times of the PPR sentimental about that peculiar cuisine? Are there any products they miss? Or has everything related to this cuisine sank into oblivion? Milk bars (named after the predominance of dairy and vegetarian dishes on their menus) had their golden age in the times of the PPR. Most were closed after 1989, but some of them survived and many people are still sentimentally attached to them. In Warsaw, for instance, there is the cult Bar Prasowy (Press Bar), which is still in business (except for a short break in 1945). It’s not only a canteen, but also a popular place for meetings and cultural events. In Gdańsk, the Turystyczny (touristy) milk bar has been open since the 50s. A few years ago, it was recommended by the British newspaper The Guardian in its ranking of the “Best of Poland”. There probably isn't a single Pole from the older generations who has never dined in a milk bar at some point in his or her life. Its “house specialities” were dishes made with eggs and flour: omelettes, egg cutlets, and pancakes, as well as various kinds of dumplings, groats, soups, and less commonly, meat dishes. Many people remember their blue-rimmed white plates and cups with Społem inscribed. Społem, which translates as “together” in English, was the common consumers’ cooperative established in the 19th century. Memories of the aluminium cutlery and tables with laminated tops instead of tablecloths are also evoked. Poor ventilation guaranteed that clothes and hair would be permeated with cooking fumes. 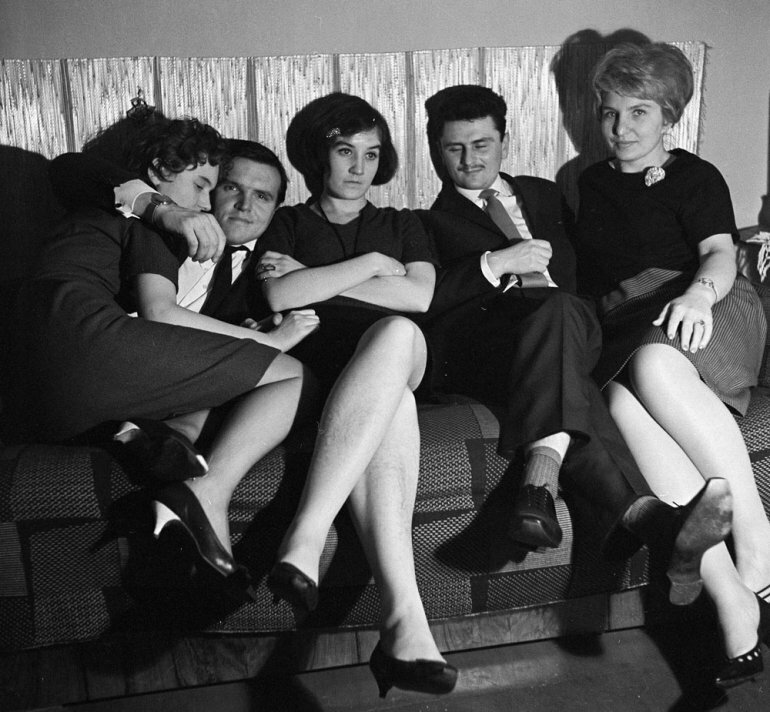 The bars’ customers represented a cross-section of the entire society: workers, officials, university professors, students, and pensioners. The staff, mainly female, wore white aprons and caps. A grotesque image of Polish gastronomy at the turn of the 70s and 80s was presented in the famous comedy Miś (Teddy Bear). In one scene, a dirty cook throws clients a grey rag to wipe their plates with, which themselves are permanently screwed to the table. Fortunately, despite that image, milk bar food was quite tasty, if simple. Milk bars are still popular thanks to their low prices. Their menu, as it was years ago, is displayed on a board in the front, near the entrance. The bars are supported by municipal councils through preferential rental rates or subsidies. They are even visited by foreign tourists. Though modernized, they’ve maintained some of their retro style: the tables are still covered with oilcloths and the staff are still dressed in aprons. In the PPR, it was hard to get any good coffee or tea, or soft drinks in the summertime. Among teas, the Georgian ones were widely known to be the worst, so they are probably not missed by anyone today. Coffee was brewed “Turkish style”, which means that boiling water was poured onto the coarsely-ground coffee, and this custom is still practised here and there. Both coffee and tea were served in glasses with basket-like holders made of metal. Part of the PPR’s folklore, fondly remembered by many, was the street wagons with carbonators. They offered soda water, sometimes with a little artificially-flavoured syrup added. The glasses in which the drink was served were so poorly washed that the drink itself gained the nickname gruźliczanka (tuberculosis water). In many houses, people used siphons to make soda water. 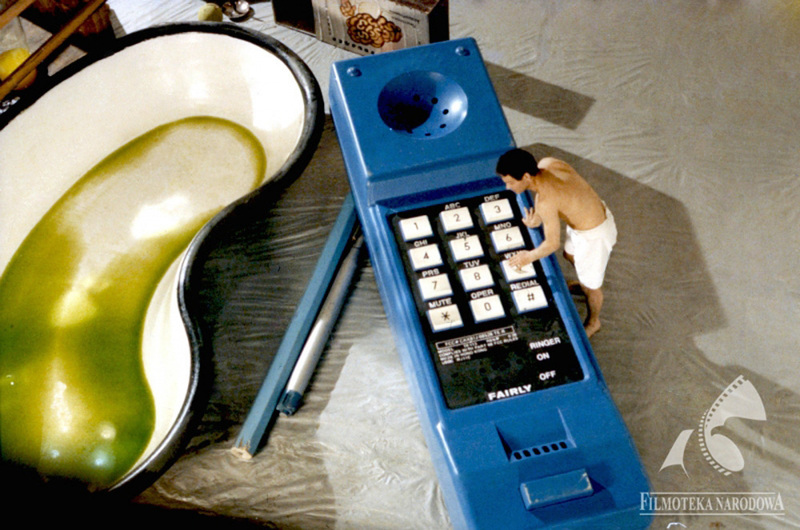 These devices even had their own place in Polish cinema. The legendary Polish actor Zbigniew Cybulski played a siphon-maker in the film There Will Be No Divorces. The so-called “private initiatives” sold artificially-coloured orangeade in small foil bags. In the 70s, a distant cousin of Coca-Cola named Polo-Cockta appeared. The drink was hardly a substitute for the original but many people used to find it quite tasty and recall it with fondness. The product has survived to this day under a different name. Just like the aforementioned siphon, Polo-Cockta also featured in a film – the fantasy comedy Kingsajz from 1987, in which the drink had magical properties: it enabled gnomes called Polocockters to remain in a human-sized state – the eponymous “kingsajz” (the English phrase “king size” written phonetically in Polish). At home and in canteens, there were also compotes, fruit cocktails and sour milk to drink. An orange-flavoured soda called “Ptyś” was also popular. A widely-practised custom that disappeared after 1989 was the daily delivery of milk to one's front door. An entire month's subscription to the service could be bought in groceries for a small fee. Every morning, staircases in all blocks of flats resounded with the clinking of glass bottles topped with an aluminium cap. 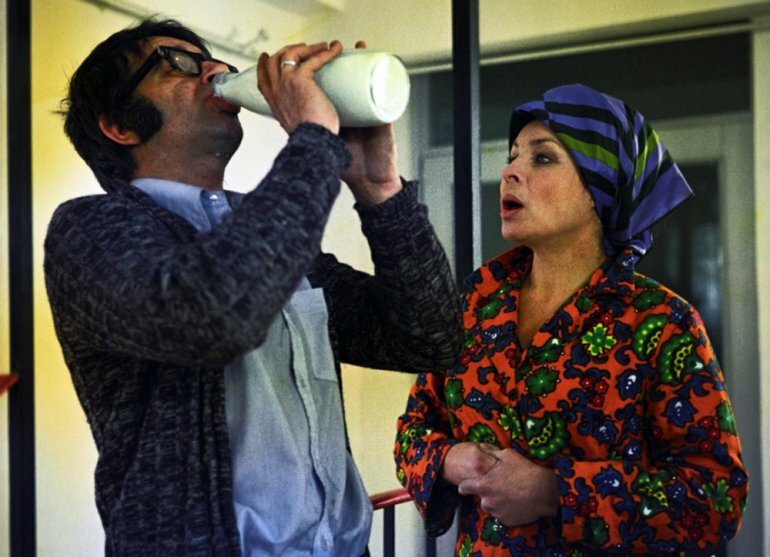 Nowadays, many people miss not only the milk deliveries, but all of the PPR’s dairy products: cottage cheese, sour cream and kefir. They also claim that it tasted better than what we buy today in the supermarkets, something which also applies to bread. 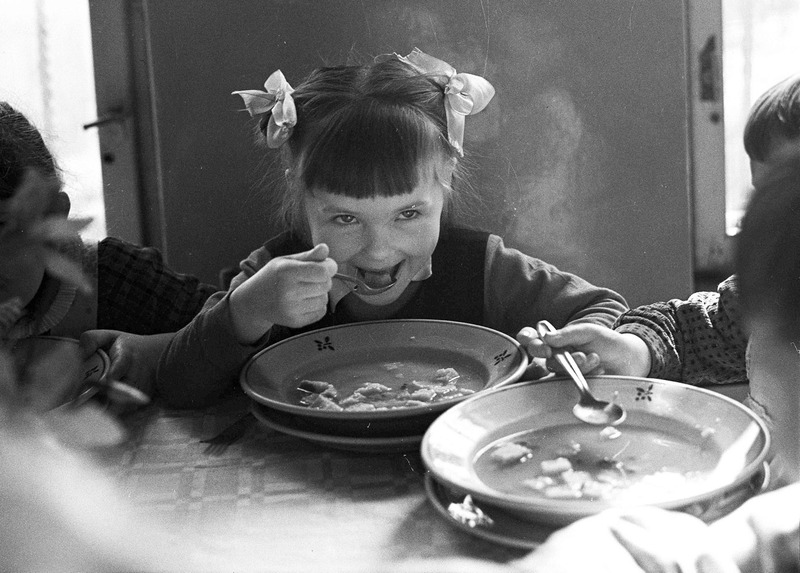 For most of the children born in the PPR, the meals served in nurseries and kindergartens were a real nightmare. For breakfast, it was semolina, burnt milk with skin formed on top, or milk soups with overcooked noodles and, of course, milk skin. However, noodles with cottage cheese, “lazy” dumplings (with cottage cheese mixed into the dough) with breadcrumbs, rice with cream and overcooked apples, or racuchy (a kind of pancake or sweet fritter, often with apple inside) – all of them abundantly sprinkled with sugar – are childhood dishes many adults still gladly savour. During meals, children were forced to eat everything on the plate. For dessert, a liquid jelly or pudding was served. The food was meant to be nutritious and everyone was supposed to eat “properly”. In the PPR, people became masters of improvisation – substituting ingredients and creating dishes out of nothing: chocolate desserts without chocolate, marzipan from beans or carrots, pork cutlet made from mortadella. The theme was picked up by cookbooks, which published advice on what to replace the missing ingredients with. And thus, ham was for example replaced by mortadella (which, by the way, didn't have much in common with the Italian version). Instead of vinegar or lemon juice, lettuce was eaten with sour cream. Some dishes were given names referring to foreign countries, though they themselves had nothing common with those countries – for example, Breton beans, Greek fish or Japanese herring. When facing problems with the meat supply, resourceful housewives used to inform each other discreetly about what had only just appeared in a given shop. Meat dishes could also be ordered in restaurants. There were pork cutlets (still popular today), steak tartare, pig’s knuckles, bryzol (a pounded beef or pork steak), sztufada (a kind of stewed beef), Pozharsky cutlet, and paprikash, as well as giblets (liver, lungs, brains and kidneys), which have recently become popular again. On Sunday, there was broth cooked with wołciel (a portion of beef or veal on the bone). It was recorded by Małgorzata Musierowicz in her cult novel Opium w Rosole (Opium in Broth). Cold cuts were hard to get, but their quality wasn’t bad. The most popular Sunday dinners, still popular in many houses, were the aforementioned broth or tomato soup, and roasted chicken or pork cutlet served with sauerkraut or puréed beets and potatoes. Despite the hardships, Polish cuisine flourished during the holidays. Although Polish Christmas is primarily associated with breaded carp (the fish was popularised in this time), other dishes, such as borscht with dumplings, mushroom soup, and traditional cabbage, were also prepared. 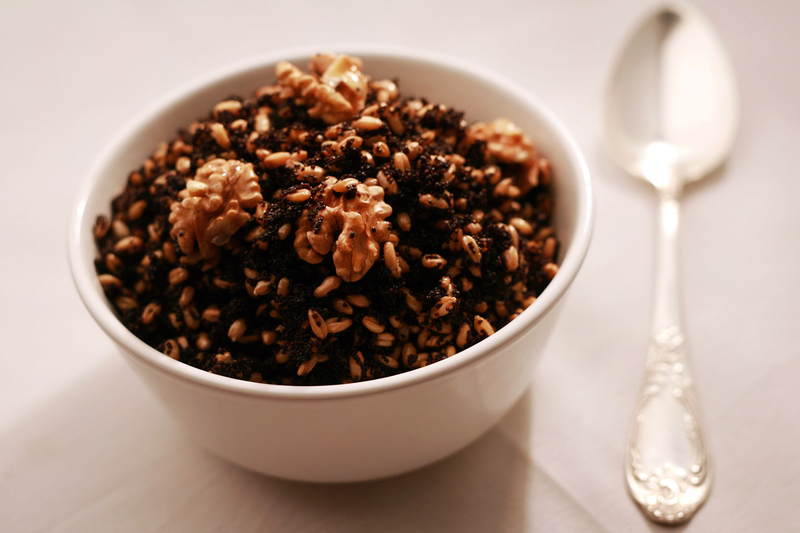 In houses where families from the former eastern Polish borderlands lived, kutia (a traditional Christmas dish made of boiled wheat grains, poppy seed, nuts and honey) was also popular. Easter brought with it baked hams and bacon, as well as hard-boiled eggs served with horseradish. The custom of eating fried carp has survived to this day, and a large part of Polish society can’t even imagine a Christmas Eve supper without it on their table. For people who spent their childhood or youth in the 80s, the times of the PPR are mostly associated with specific sweets. As both butter and sugar were rationed and high-quality ingredients like almonds, citrus fruits, chocolate, and coffee were scarce, these desserts had to be improvised. 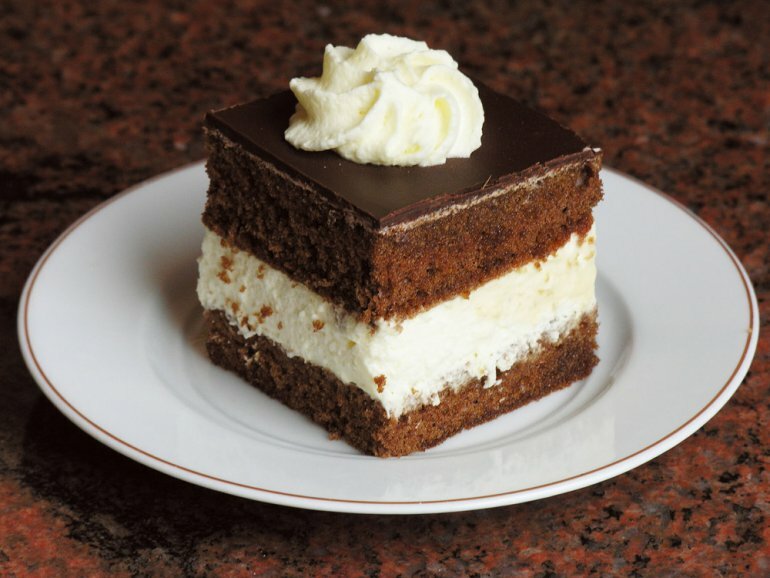 “Chocolate-like” products were prevalent, but the real hits were “chocolate” blocks (with no chocolate), “nougat” made of milk powder, cake with semolina cream, wafer roulade with cocoa and lemon cream and desserts made of cottage cheese and biscuits. At home, children used to make a kogel-mogel, which is egg yolk mashed with sugar, sometimes with a little cocoa added. Nobody worried about salmonella. Warm memories are also brought to mind by Bambino ice-cream (the most popular kind of ice cream on a stick) or Calypso ice-cream (sold in cubes like butter), as well as Vibovit, a powdered vitamin drink, or powdered orangeade. Some people used to eat a slice of bread with butter and sugar for dessert, sometimes topped with a milk skin – a delicacy that would revolt most people nowadays. The so-called cocktail bars were also popular. They didn’t serve alcohol at all. Instead they offered desserts, pastries and the fruit cocktails of many flavours which were fashionable at the time: raspberry, strawberry or blueberry (today we would call them milkshakes), as well as fruit jellies with whipped cream, doughnuts (the local version, baked with yeast and without a hole in the middle), wuzetki (cakes whose name probably refers to the Warsaw W-Z (East-West) route built at the turn of the 40s and 50s) or Spanish cakes (meringues with whipped cream). Some of these bars have survived to this day. On Sunday, one could buy candy floss / cotton candy – a delicacy which is still sold at picnics and festivals. Hard candies in many shapes and colours, irysy (‘irises’, a kind of toffee sweet, but brittle, not malleable) and chocolate-like products were also popular, while the highly processed, sugar-filled cocoa wafer bar, the famous Prince Polo, was considered to be a luxurious treat. In the PPR, people would have fun at dances or at home. Name days in particular were an excuse for sumptuous feasts. The table would have to be covered with a starched tablecloth. Despite shortages in shops, tables used to creak under the weight of sausages, cold cuts and pâtés. 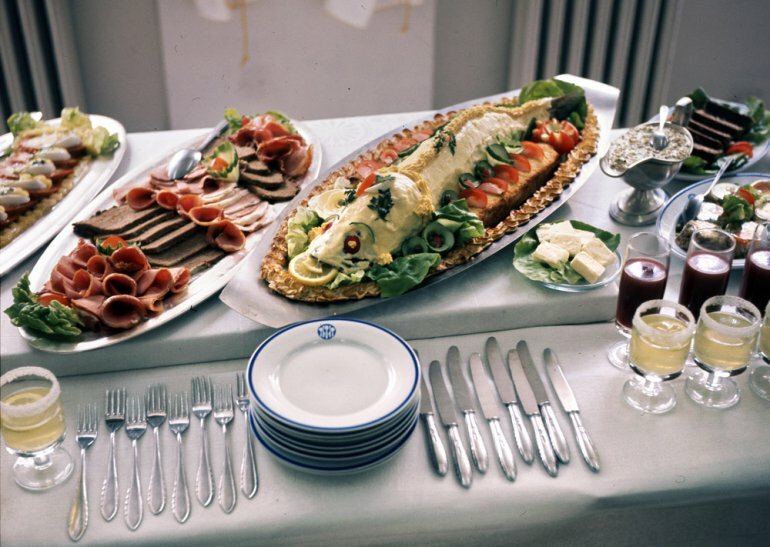 Among others, there were herrings in vinegar or oil, cold chicken legs in jelly, tripe soup, hard-boiled eggs with mayonnaise, marinated mushrooms, vegetables and fruit in vinegar, and pickled cucumbers. A must for each house party’s menu was a salad made of vegetables cut into cubes and mixed with mayonnaise. It was topped with parsley or an egg shaped like a mushroom. For dessert, cheesecakes were served, as well as home-made seasonal fruit pies, chocolate blocks or artificially-flavoured cakes soaked in rum. Vodka was drunk at these parties, as well as the illegally distilled home-made nalewka (a kind of traditional Polish alcoholic beverage similar to medicinal tinctures), or wine. There were periods when only vinegar was available in the groceries. At moments like this, the situation could be rescued by a relative living in the countryside, or by buying things on the black market, or even by owning a small plot of land. Despite the partial collectivisation of farming in Poland, some small family farms survived. At the most important parties, rural cold cuts were served. Their taste is still recalled with fondness by many. Rescue also came from employee or cooperative allotments, where fruit bushes and trees, as well as vegetables, were grown. Home processing also flourished. There were tons of gooseberry, cherry, currant, raspberry, strawberry, plum, and apple compotes made, as well as jams, marmalades, preserves, tomato purées, and pickled cucumbers, pumpkins or plums. Despite the wide range offered in today's shops, home processing is back in fashion, and so are private gardens, although for other reasons. The fashion for fast food didn’t spare the PPR. 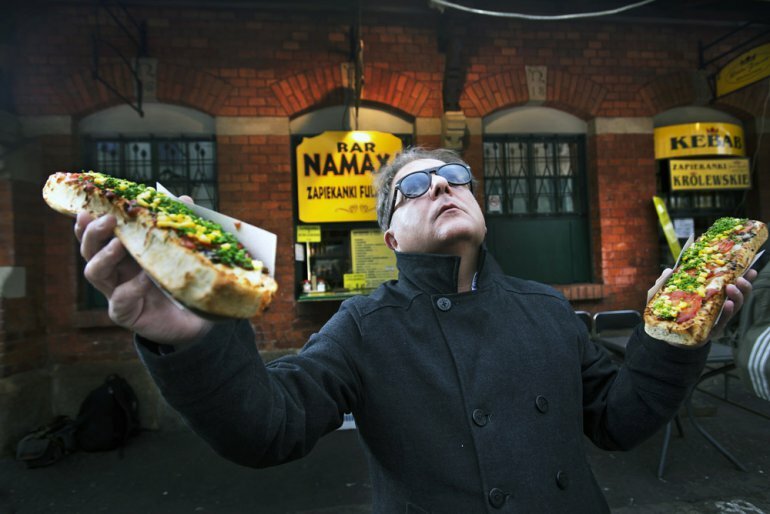 In small booths run by prywaciarz (pejorative designation for private entrepreneurs) one could buy a “hot-dog” with mushroom filling, or later, with a Leszczyńska sausage and mustard. The 80s were also the time of kajzerkas (small round rolls) with cutlet and mustard and zapiekankas (a kind of open, toasted sandwich made of a baguette-like roll cut in half and topped with cheese, mushrooms and ketchup). The latter are still popular nowadays, and are available 24 hours a day in Kraków’s Kazimierz district (New Square). Unfortunately, they are mostly made of industrial, frozen ingredients. In the PPR, people also experimented with home-made pizza. Housewives used to provide each other with recipes for a pie with extra thick dough and onion, mushrooms, cold cuts and a thick layer of cheese on top. It is still made in some homes. Some of the PPR’s cult products have survived to this day: Krakus canned ham, Prince Polo wafer bars (which first appeared in the 50s), and Inka chicory coffee. Although they have changed their packaging to more modern-looking designs, their ingredients and tastes have reportedly remained the same. 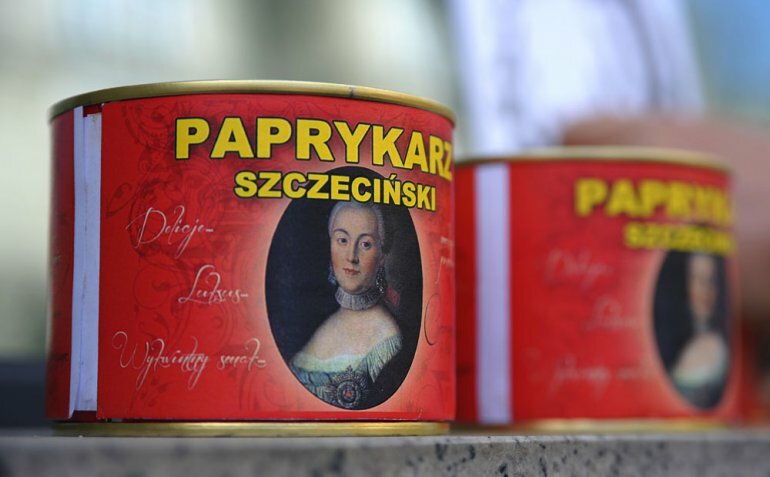 Some people, when going on a trip to the mountains, load their backpacks with products remembering the past era, such as Paprykarz Szczeciński (The Szczecin Paprikash – a canned mix of fish, tomato purée and rice), Podlaski pate, Konserwa Turystyczna (Tourist Preserve – a can of ground meat with a pink logo) and Kukułki (Cuckoo sweets – hard candies with alcohol and cocoa filling). People return to the tastes of their childhood or youth out of sentiment or habit. Today, the fashion for the PPR has also reached cooking. Bars with interiors and menus referring to the past era have emerged in cities. 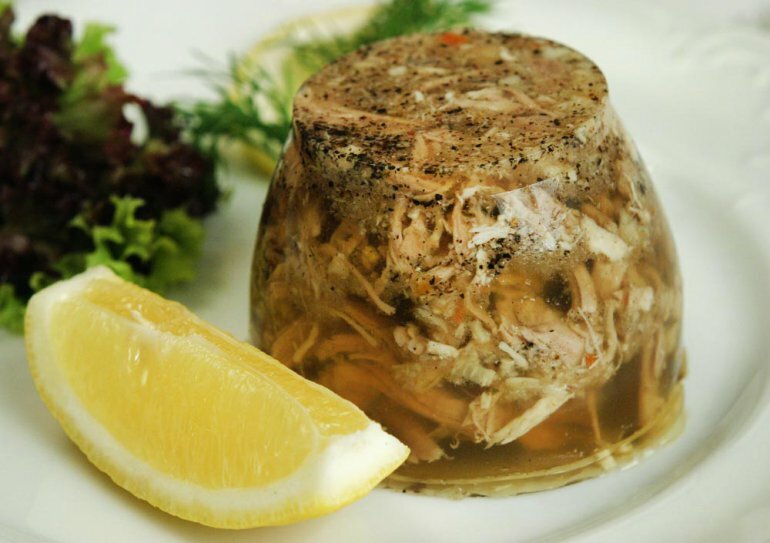 There, one can order typical bar dishes from the PPR: the famous lorneta z meduzą ("binoculars with jellyfish", which is chicken-leg jelly served with two vodka shots), as well as herring in oil or steak tartare – both also served with vodka, which was drunk in enormous amounts in the past era. The fashion for the PPR is visible also in the interior design of kitchens. For some time, the enamelled serving dishes and rimmed cups have been back in favour. Culinary bloggers even try to hunt down plates with the PSS Społem logo at flea markets. Some people still have PPR-style house parties. Some of them even cover their tables with old newspapers (this Soviet custom seems a bit strange, because in reality, tables in the PPR had to be covered with a starched tablecloth). And the menu obviously has to offer the dishes typical of that period, all of which have been already described above.